Getting a passport for a baby isn’t that much different than getting one for an adult and we recently did this for our son for a trip this summer. The only “tricky” part was the photo! The first step is to get the photo. Here are the rules for the passport photo, in case you want to do it yourself – the photo must be in color on photo quality paper, sized 2″ x 2″ (51 x 51 mm). They want the size of the head to be between 1 inch and 1 3/8 inches from the bottom of the chin to the top of the head and taken within the last six months. The background must be a solid white or off-white background, no colors. Your face must be facing directly forward, centered, with no smile, keep a neutral expression and both eyes open. Your clothes must be normal street clothes that you would wear on a daily basis, religious clothing is allowed but no uniforms. Do not wear a hat, or anything on or around your face if you can avoid it, unless it is religious in nature and worn every day. Here are some examples of good and bad photos. I think the rules for babies is a little laxer because our photo fit almost all the rules except his mouth was open. He wasn’t smiling but I’d imagine a neutral expression usually means a closed mouth. Since that wasn’t explicitly listed as a no no, we submitted it anyway and the processor had no issue with it. The next few steps are the same for a child, under the age of 16, as it is for an adult. It consists of filling out and submitting Form DS-11, the Application for a U.S. Passport, and additional information that identifies the child and the parent or guardian of that child. DS-11 Application, along with passport photos. Evidence of U.S. Citizenship for the child – You can use a previously issued Passport, certified birth certificate, naturalization certificate, or certificate of citizenship. We opted to go to our local library, instead of the post office, because they offer this service for a $25 fee (same as the post office) and we figured it was going to be a little faster. After fifteen minutes and $105 later ($25 processing fee, $80 passport fee), we were done. Passport will be here in 4-6 weeks. 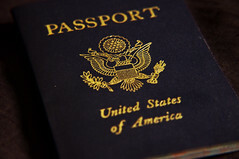 Remember, passports for children expire every five years. I think it is the US Consulate that handles the passport issuing not the Embassy. Usually they are close to the same location. Be sure to bring enough money, they still want to be paid.